The National Herald newspaper was founded by Jawaharlal Nehru in 1938. Since then, it has always been as a mouthpiece for the Congress party. In 2008, it had ceased operations completely, and from being a Congress owned entity, it became a personal asset of Rahul and Sonia Gandhi (along with property worth thousands of crores of rupees), via their company Young Indian. This takeover was deemed as a scam by BJP leader and former union minister Subramanian Swamy, and the case is still on. A detailed explanation of how this is a clear case of impropriety is explained here. Meanwhile, in November last year, National Herald was relaunched by Rahul Gandhi, albeit in a digital avatar. The relaunch can be considered as a puzzling move since the Congress has many mouthpieces and stooges masquerading as independent media houses and journalists. But now, it maybe is clear why this decision was taken. National Herald might have been relaunched with the sole intention of spreading gross untruths, which other media houses may refuse to publish in an era when lies are pointed out by the alert readers. One such case was exposed by lawyer Kartikeya Tanna on social media. In a series of tweets, Tanna referred to an article published in the National Herald, which was riddled with falsehoods. We are also convinced by the fact that the State Government has taken all possible steps to safeguard the general public interest and by this venture of the State Government a citizen will not be put to any loss or will not be deprived of any basic medical facilities which otherwise he would have got from the civil hospital which was earlier being managed by the Society but, on the contrary, with modernisation of the hospital and with introduction of super-speciality teaching hospital equipped with the state-of-the-art medical equipments the quality of medical services will be much – much better. This High Court verdict without doubt clarifies that there was no hanky-panky in the dealing. But National Herald chose to ignore this important point, in order to further an agenda. Fiction: The National Herald article also stated that the above case, had now reached the Supreme Court, where it was pending. It may be noted that this was stated in the above article, which was published on 17th February 2017. Fact: As Tanna pointed out, contrary to claims that the case was still pending, the case was actually disposed by the Supreme Court. The Supreme Court had trashed the appeal of Chaki, saying that the Court had “heard the learned counsel for the parties at some length and it did not see any error of law on jurisdiction” in the High Court’s order. In fact, this order was passed by the Supreme Court way back on 1st December 2016, so the contention of National Herald that the case was still pending was a blatant lie. Also, Health Ministry issued permission to Adani Institute for medical college in 2009. 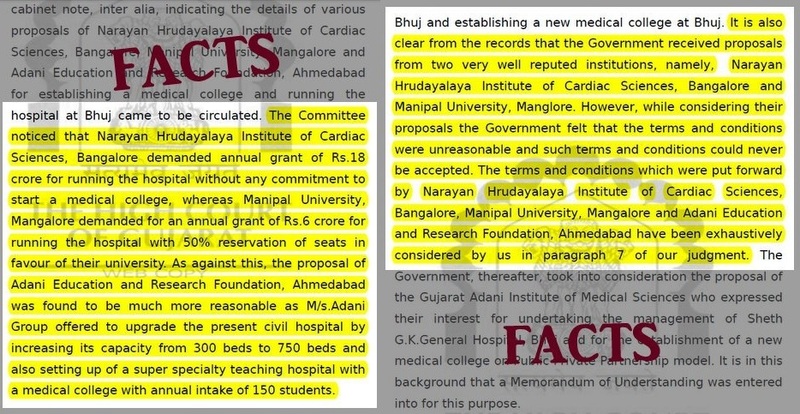 If at all this entire procedure had been done at the instructions of then Gujarat CM Modi, why did the then Congress Government at the centre allow a medical college to be started by the same person at the same hospital? This in fact is what “Post-truth” and “Fake news” is all about. But will anyone from Indian media stand up and question National Herald, and the Gandhi family that owns it? Does anyone in India have the moral standing to do so?